Virginia Beach, Va. – The Association for Research and Enlightenment (A.R.E.) recently renewed its partnership with Baar Products, Inc. Considered by many to be “the father of holistic medicine,” Edgar Cayce produced a tremendous legacy of information about healing the human body the holistic way. This information included formulas for healthful tonics, beneficial oils, rejuvenating remedies and more to help stimulate and support the body’s own healing mechanisms. Today, Edgar Cayce’s Association for Research and Enlightenment (A.R.E.) partners with Baar Products to offer a special collection of products and remedies drawn from Cayce’s work. 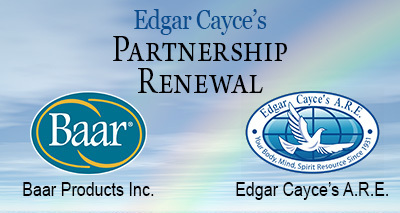 As the official exclusive supplier of Cayce health care products, Baar works closely with the A.R.E. to ensure that original formulations are used whenever possible. “From Respicol® cough syrup to Crudoleum® hair care to Arthro® joint relief, all of our ingredients are selected and formulated to meet the highest standards our customers have come to know and expect,” said Bruce Baar, MS, ND, owner and CEO of Baar Products. “Purity and freshness of our products is our highest priority.” The company recently opened a new fully solar manufacturing facility, and Baar maintains 130 acres of pristine land in Pennsylvania and Tennessee to preserve and provide among the world’s best natural products. A popular example of a Cayce health remedy is the castor oil pack. At its most basic, a castor oil “pack” involves placing castor oil externally on the abdomen. Castor oil is used to improve assimilation, eliminations, and circulation, especially of the lymphatic system. At the A.R.E. Health Center & Spa, and the A.R.E. Bookstore & Gift Shop, only Baar Products’ castor oil is sold or used. Baar’s castor oil is trademarked as Palma Christos®, and is organic, cold-pressed, and cold-processed, with no solvents, synthetics, or other additives, just as Cayce himself would have wanted. This partnership confirms that the ideal and vision of the Edgar Cayce legacy is being continued with attention-to-detail, quality, and authenticity. More information can also be found in Baar’s A.R.E. Partnership Renewal Press Release.